The Court Theatre’s annual summer musical is a much-anticipated spectacle. Year after year, they bring us a curated mix of old and new favourites, given the Court Theatre treatment. Following up last year’s relatively new Legally Blonde (I still find myself singing Omigod You Guys under my breath in inappropriate settings), the Court Theatre has gone for a classic this year. The Court’s production of Chicago feels fresh. Don’t worry, it hasn’t been weirdly reimagined in a different time or anything (a major concern for me since I saw Joseph set in "modern times"*), the core elements of jazz, media, manipulation, and a prison where inexplicably every woman wears only lingerie are still present and accounted for, but it feels like it has been looked at with fresh eyes. The nature of Chicago is that the era, the women, the murders and the drama are all larger than life. The risk with this type of show is, if pushed too far, it can appear cartoonish, with caricatures instead of characters. 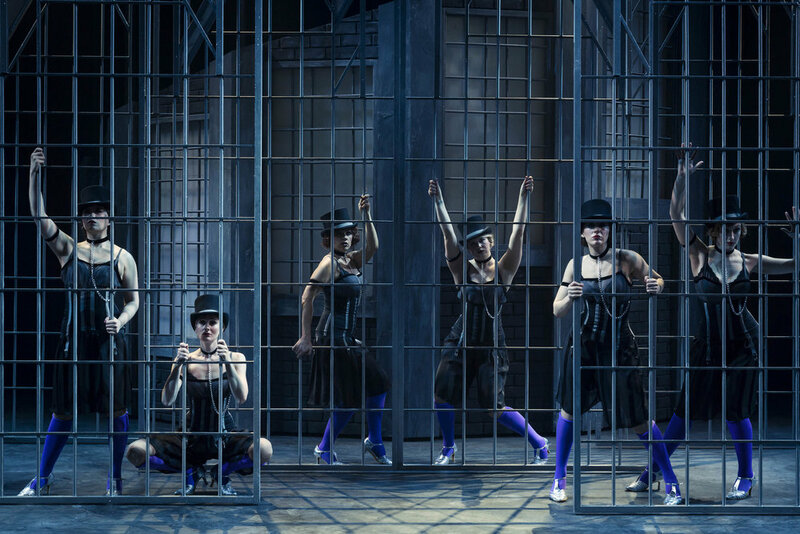 The Court’s version of Chicago brings nuance into the performance, the story is brought to the forefront and there are moments of genuine emotion alongside the big iconic numbers. It is stunning, funny, moving and damn impressive. I don’t know what they have done, without deviating from the things that make Chicago great, they have managed to make it feel new. Given the plethora of standout performances in this show, I would usually shy away from singling one out but I feel the need to discuss the performance of Nomi Cohen as Roxie Hart. I have long viewed the character of Roxie Hart as one of the most annoying characters of all time. I considered her to be one dimensional, a bit whiny, petulant and manages to be insipid even when taking some actions which are objectively going large (murder, for a start). She is a conundrum, that I never really got or liked and certainly didn’t hold a candle to Velma Kelly. Look, personal opinion and aimed at the character and not any of the actresses I’ve seen play her. No matter how strong the performance, I always found that Roxie’s whiny annoyingness seeped out - the part took over the actress. Here, the actress took over the part - and I finally feel like I get it. Nomi Cohen’s performance has, for me, completely transformed this character. I really shouldn’t try to hazard a guess at why this performance was such a revelation, but it's happening. My read was that Cohen played the character as more openly manipulative, clearly showing that the insipid ingenue act, is just that. The clear calculation behind her shadier moments actually made me respect Roxie a little more than usual. Instead of trying to be the damsel in distress, it was clear that Cohen’s Roxie was playing the role of Damsel. Less cloyingly annoying, more evil genius - a little glimpse behind the curtain made all the difference and I got something out of it I hadn’t before. Perhaps I just didn't see it earlier, but whether I am slow or not, I suspect you would struggle to find a better Roxie in any theatre, anywhere. Luckily, Darlene Mohekey’s brash and hilarious Velma Kelly is more than a match for Roxie 2.0. Her powerful voice commands the attention deserved (and expected) by Ms Kelly and the comedic side of the character is particularly strong, with quips delivered with precision timing. Equally convincing playing the strong, pleasurably arrogant side of the character as the moments where she has to resort to a bit of grovelling (we've all been there). I’ve said this before and I will say it again, Rutene Spooner is a Court Theatre treasure. His voice is always insanely good but his Amos was perfection. Drawing long “awwww’s” from the audience was like taking candy from a baby and his vulnerability as Mr Cellophane brought moments of genuine anguish amongst the bustling, larger than life moments that make Chicago what it is. The soft, timid start to his namesake song had us on the edge of our seats, hoping the voice which has graced the Court Theatre stage in a number of memorable performances would unleash in full. I can save you some worrying - you get your moment and it’s worth the price of admission alone. If I namecheck everyone who stole the stage this will become a dissertation but finally, Roy Snow as Billy Flynn was debonair as always and wouldn’t disappoint anyone secretly hoping Richard Gere might reprise his role. We Both Reached For The Gun is a highlight. Finally (again), Isaac Pawson as Mary Sunshine is an absolute delight. As for the remainder of the cast, when an ensemble includes someone capable of playing Wicked’s Elphaba (Jane Leonard) it's safe to say its the A Squad. It feels redundant saying this about a Court Theatre musical as it goes without saying but the set and costumes were stunning. Eilish Moran’s Mama Morton was a showstopper with hints of Disney villain and Rocky Horror. Clearly, trouser fashion amongst lawyers in 1920's Chicago resembled palazzo pants but Roy Snow pulled them off - I don't know how, but he did. The set was streamlined, elegant and effective. It’s a show full of strong women, in a time our headlines speak to female empowerment - as long as you don’t take the message too literally. There are other ways now to get empowered which do not involve murder. *This Joseph was not a Court Theatre production.